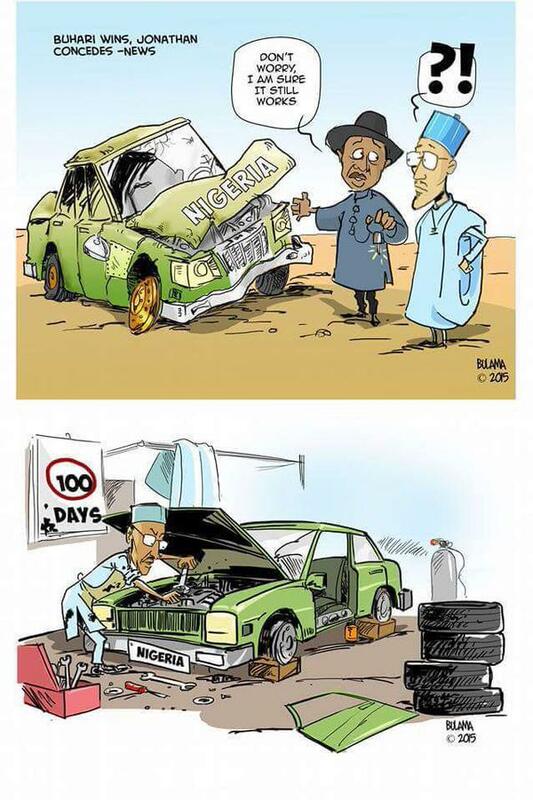 Posted byOo Nwoye	 September 5, 2015 September 5, 2015 1 Comment on My Take on Buhari’s First 100 Days. The quote above best summarises what I think of Buhari’s first 100 days. But I’d like to expatiate a bit using an extended analogy that factors in the perception of Nigerians vis-à-vis the typical Nigerian leadership. I would liken Nigeria to a large vehicle. The President, a mechanic-driver (who repairs the vehicle s/he drives); the passengers, Nigerians, and our a very long journey, our future. The mechanic-driver has a lot of assistants for navigating, communicating with the passengers, fixing the car etc. We have a car that has always been in a pretty bad shape making lots of internal noises, lots of scratches and rust on the body. Every 4 years we, the passengers, have had the chance to choose our mechanic-driver. And for the past 16 years, the passengers have kept on choosing the same company to provide the driver. Typically, when a new driver from this company takes over the wheels, they quickly open the bonnet change the fan-belt (which reduces the noise) spray here and there on the body (they have assistants) and start driving. After a few kilometers, the noise gets worse again and the whole scenario repeats itself. During the journey, the assistants quickly shut up complaining passengers. Even some passengers shut others up. It can be really rowdy! The passengers got tired and CHANGED the company that provided the mechanic driver and this new guy took charge 100 days ago. Unlike the other guys though, this one has been doing things from the fundamentals. Instead of quickly jumping in the car and appointing those who will take charge of different departments, he decided to take time and find out what has been happening. Why oil dey always short, why the wheels are always wobbly. Most of the passengers are not used to this. They are getting hot and they need to know they will reach the next stop in time. Those that campaigned for the new mechanic-driver know it is better to spend time finding what is wrong and fixing it from the source. So we have a smoother ride with less stops along the road. When the mechanic-driver is under the car, it is the job of someone to let them know what is going on. After all, it is not everyone who can see what is going on there. Well, it’s 100 days gone and the interviews are over. The security department has been filled. He has found out why the fan belt is always cutting, crank shaft get as e be, oil short e.t.c. In a little over 3 years, it would be ONLY the progress made that would count when choosing a mechanic-driver for another term. Intention and ‘what is almost done’ will not count. I have total confidence in the capability of oga mechanic-driver. Carry go, my General! PS: Forgive typos and fill in the gaps if you notice the analogy breaking down anywhere ;). If you liked the post, please click here to tweet it. Thanks Boro for looking through this post.